LAUDERHILL, FL — The City of Lauderhill and the MLK Task Force host several events around the Martin Luther King, Jr. Holiday and Black History Month. 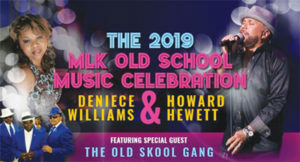 After the Elementary School Civil Rights Spelling Bee and the Middle School Brain Bowl have come to an end, the Task Force is excited to announce its 2nd Annual OLD SCHOOL MUSIC CELEBRATION featuring Deniece Williams “Let’s Hear It for the Boy,” “Silly,” “Too Much, Too Little, Too Late”), Howard Hewett (“Second Time Around,” “For the Lover in You” and South Florida’s own Old Skool Gang. This ticketed event will be held on Saturday, Feb. 16 at 7 p.m. at the Lauderhill Performing Arts Center (LPAC), 3800 N.W. 11 Pl., Lauderhill, Fla. 33311. Tickets are on sale now starting at $35, and VIP tickets are also available. To purchase, you can log on to www.lpacfl.com or call (954) 777-2055. The LPAC Box Office is open 10 a.m. to 5 p.m., Monday – Friday and Noon to 4 p.m. on Saturday. Don’t miss this unforgettable concert experience starring these award-winning singer-songwriters. Seats are limited, and this event always sells out! The proceeds benefit college-bound high school students via the MLK Scholarship Fund.